Author: Joseph R. Katra, Jr., et al. Description: 1989 full year set, vol. 31, nos. 1 - 6 (issues 258 - 263). Also Supplement No. 17, Summer 1989 ("Clockmakers and Clockmaking in Southern Maine 1770-1870" by Joseph R. Katra, Jr.). Light surface wear. Bright and clean. Free of markings. 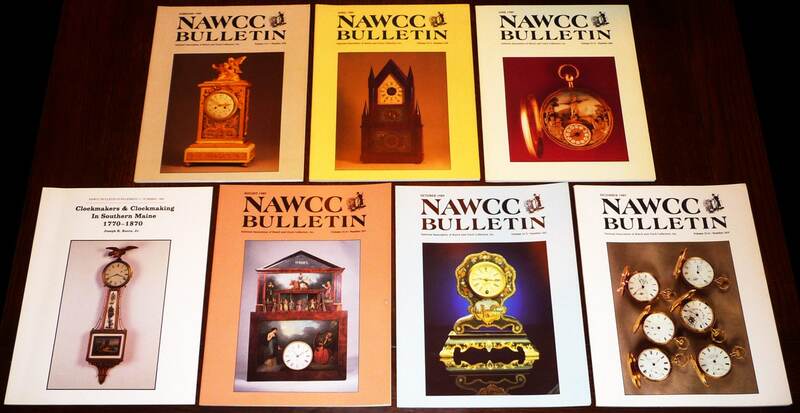 Some featured article topics: Anne Boleyn's Clock, Texas' Seths, "Un-Rare" Watches, White Dial Clock, Birge and Ives, Lepine Watches, White Metal Repair, Backyard Sundial, Electro Clock Company, McIntyre Watch Company, Black Forest Clocks, Collecting Watches, Gravity Drive, Connecticut Marines, Craft Contest Winners, Railroad Timekeepers, State of the Association, Charles Hoyt, Fusee Grooving Attachment, Index, and Phelps Striking Clock.